Home › Uncategorized › All Markets Positively Correlated. Weekly Report, week ended Friday, 20 March, 2015. All Markets Positively Correlated. Weekly Report, week ended Friday, 20 March, 2015. 1.Australian Market: Weekly Sector Performance Chart. 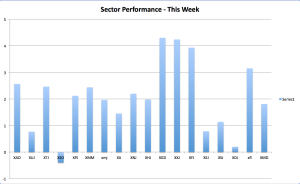 2.Australian Market: Weekly Sector Performance Chart for Alternative Investments. 6.Australian Market: Health and Telecoms. 12.Appendix 1 – Diversified Portfolio, Criteria for holding stocks. A Work in Progress. 13.Appendix 2 – Performance Chart of the DP compared to XJO. XAO was up strongly this week, +2.56%. Ten S&P Sectors were up. The best performing sector was XFJ (Financials), up +3.93%. That was well ahead of the next best which was XTJ (Telecoms), up +2.46%. The worst performer was XDJ (Consumer Discretionary), up only 0.2%. ‹ CHART REVIEW – UPDATE ON SIRTEX.